She's Fantastic: Realm of the Claw's ZYNDA! Realm of the Claw's ZYNDA! Man do I love a good cat-person. Animal-themed properties are always popular in the action figure market and I'm frankly surprised we don't see more. 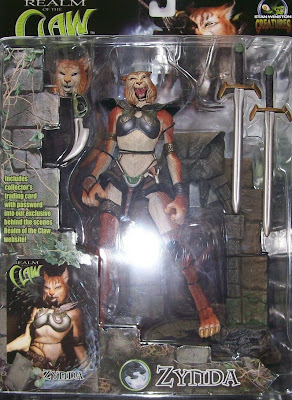 Continuing my topic of Stan Winston Creatures (from yesterday's Kaela post), this toy company had only a brief period of production but managed to put out a lot of really great toys in that short time. As you would expect from a master of special effects, the figures are hyper-detailed and lean toward darker or more violent themes. After Realm of the Claw, my favorite series of his is Extreme Gargoyles. Blood Wolves was pretty awesome, too. Unfortunately the only females made were the two I have reviewed and the She-Creature. I would have loved to get a female gargoyle or werewolf in this style. I bet there are concept sketches or prototypes hidden away in some vault that we will never see. The ladies notoriously get the axe in fantasy lines. 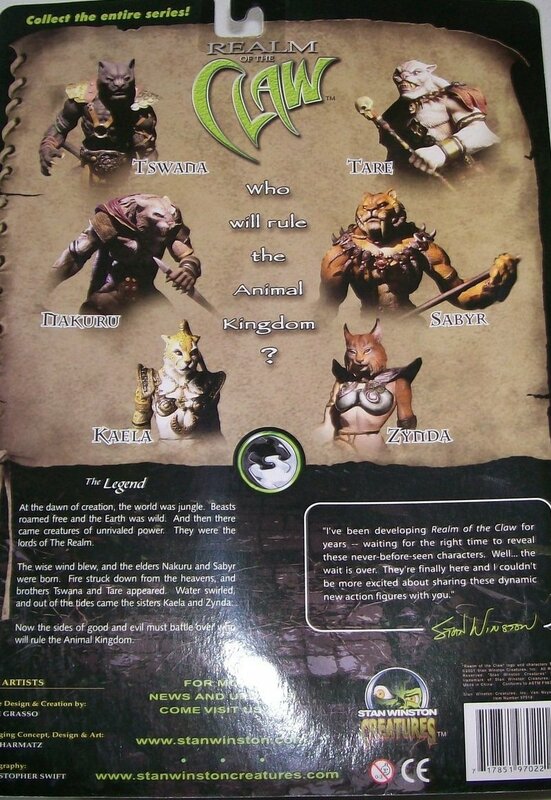 Zynda is my favorite character from this series. I love that's she's a Lynx. I love that she didn't require a ponytail to express her femininity. And I love her armor and swords. On to the review! Here are a few pictures of her with her alternate "calm" head. I like this second head a lot, but I much prefer the dynamic fierce look. And here are Kaela and Zynda together.